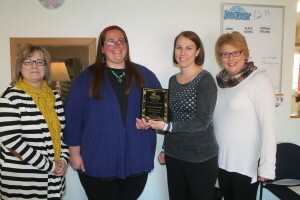 Kayla Mundorf of Community Connections Inc., has been named the employee of the year and was presented a plaque by the Winner Area Chamber of Commerce. She has worked for CCI for seven years and works the third shift at one of the residential sites. Staff of CCI say a person has to be special to work overnight. It is a shift that requires a person to be independent, dedicated and self motivated not to mention that you have to help people in their home with their daily needs. The person who works the overnight shift has to be caring and trustworthy. “Kayla is all those things and much more,” said staff members. She lives 45 miles away and still makes it to work on time and ready for work no matter the weather. If the weather is bad, she stays in town just in case she is needed at work. Mundorf volunteers to work on holidays, she picks up extra days and at different places if asked. She has been known to play secret Santa and bring in entire holiday meals for the people she supports who cannot afford a meal on their own. She spends her own money buying stocking stuffers for those who otherwise would not get a gift. It is just not here at work that Kayla shows what an amazing person she is. In the summer she volunteers at a camp for children who have been abused and neglected. She participates in missionary trips, most recently to Guatemala this past April taking basic necessities and little presents to children in orphanages and those living on the street. She personally sponsors a couple of the children she met there. And all of this is in addition to raising a wonderful son of her own. “While we already know that Kayla is absolutely amazing, we have to take this opportunity to share with others just what a wonderful, awesome and amazing employee we are lucky to have here at Community Connections,” said the staff.